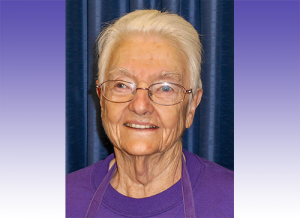 This month, we feature our longtime volunteer Lucy Rogers, who serves at our Beaumont location every Thursday. Originally from the Olympic Peninsula in Washington State, Lucy has made a home for herself in the San Gorgonio Pass. She not only volunteers with us at Carol’s Kitchen but also at the local chapter of HELP, Inc., a food pantry and utility assistance service that serves the San Gorgonio Pass. She has volunteered with us for nearly 16 years. We had a chance to talk to her this past week. I am from South Bay area and my husband and I wanted to get out of the city. At the time, I was taking LVN (licensed vocational nurse) training at El Camino College and worked at Torrance Memorial Hospital in Lomita for about two years; then we moved out here. I’ve been in the San Gorgonio Pass for 40 years. I didn’t work for a while after moving here but then eventually worked at a convalescent care facility in Banning and then for a local doctor in Banning until he retired. When I heard about Carol’s Kitchen, I was working at a facility in Beaumont and became friends with one of my fellow nurses. Later, after I was no longer working as a nurse, her husband asked why I wasn’t working at Carol’s Kitchen. I did not know about it then. At that time, I was volunteering at the HELP food bank, which I still do to this day. I lost my husband to cancer so was looking for something to do. I got tired of nursing. So when Joe Picard, my friend’s husband, told me a little about Carol’s Kitchen, I became a volunteer shortly after. I help with cooking mainly but help with whatever needs to be done in the kitchen. Since starting, I’ve always worked in the kitchen. Carol’s Kitchen has a kitchen staff, then a staff that works in the dining room and a staff that works with the clothes. I’ve always preferred the cooking. I have five children—a fairly large family and always enjoyed cooking so that’s where I stayed. One time there was a big funeral and we were asked if we could serve food at the funeral. There were about 300 people. That was a lot of work but very fulfilling. The staff is so friendly and we get along so well so I have a lot of favorite moments. I also enjoy the Christmas parties we have for children. I only work Thursdays and I enjoy it. We seem to increase our clientele pretty rapidly. We started with only 30 to 40 people 1999 then it crept up pretty fast and now we serve an average of 200 people every Thursday. We never know how many people are going to be there. But we have many, many people who come every Thursday. They’re repeats, we get to know them. We have one gentleman who doesn’t eat rice and we know that. We have one person who doesn’t eat meat and we know that. We get to know everyone in depth if they’re repeaters. There seems to be a lot of elderly people and of course a quite a few of homeless people. We get those guests not only at Carol’s Kitchen but also at HELP as well. There’s a need for them to have a good meal, visit with people and have a social life. Another thing I like is the way our kitchen is set up; we give our guests a choice of the food that we serve. If someone doesn’t eat a particular food, we can serve them something else. I like that we can give our guests choices because many of them do not have many choices in life. Giving them the choice is important to me. Come meet Lucy! Visit our Beaumont location on Thursdays at St. Kateri Tekakwitha Catholic Church.